It's a grey Monday morning here in the southern Netherlands, but despite the little bit of gloom I'm looking forward to what the week has to offer. I'm linking up with Molly at The Move to America and taking part in her wonderful Monday Coffee Morning Link up to reflect on the last week and prepare for the next. It's a great way to get your head in order for what's ahead. Last week we made it through a busy herfstvakantie (autumn vacation) week. I managed to take care of all the photos on the camera by saving them onto the computer and backing up the files on the external hard drive; and the camera was wiped to start fresh again. I had a guest post up at Earth to Jade last Wednesday - If you haven't had the chance to read it, pop on over and check it out along with some other great travel-related posts. I also succeeded in surpassing my goal of 75 likes for the Life in Dutch Facebook page last week! Thank you to all that have helped me make the goal! I'm not stopping there, though - feel free to check out the page and "like" it to get updates in your news feed! The real fun of herfstvakantie started midweek. First, we enjoyed a birthday party at the Dinosaur Museum for our good friends at The Three Under. And since all these kids are in a dino-mania stage, there was nothing but excitement the whole time! 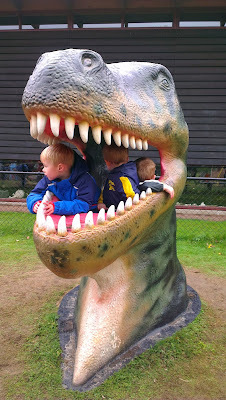 so the kids can climb on (and in the dinos). 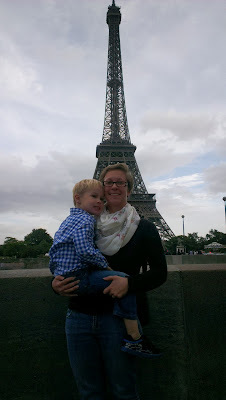 Thursday, we made our way to Paris for a long weekend. We talked up the trip with Little Man, read the Madeline series (over and over again), and checked out some photos of the major sites online ahead of time. It was a great trip (and the reason for getting the camera ready) - hopefully I will have up a post tomorrow or a bit later this week, but in the meantime, you can check out this teaser post. This week, I start by getting a writing schedule figured out. I've got another guest post coming up (more details to come!) and I want to make sure I write about Paris before the end of the week. A little while ago, I mentioned a Dutch food series I had in the planning stages... and now I start making those posts and recipes a reality. With any luck, I'll get something up in November. In short, there will be a lot of writing and cooking (and probably some burnt food) in the next week or so. Tomorrow also marks Little Man's first practice day at kleuterschool and the official transition into "big school." Ready or not, it is upon us - in just 3 short weeks Little Man will turn 4 and leave the peuterspeelzaal. Getting into a new routine in a new place can be hard for anyone, but Little Man will start spending more time out of the house "on his own" and get used to new rules and expectations - and all in Dutch. For this part of the week, I'm hoping that we do a good job of getting out the door on time and generally keep it together during this change. We're off to start ours, so here's to your week! Looking forward to the Paris post and will hop on over to read your guest post on Jade's blog! I can't wait to read the recipes you do - very exciting! Good luck to your son with the first practise day of big school! Soooo happy that you got to go to Paris! I hope you and the family had as amazing of time as my Mark and I. Can't wait to see the posts about all of your travels. Hope Little Man loves his new adventures with school! Thanks, Katrina! I'm planning lots of pictures - and you can bet I wanted to eat my weight in pain au chocolate. So far Little Man is excited for school - so I hope he retains that enthusiasm after tomorrow! Whoahhhh so much going on. Wishing you (and the little man) all the very best of luck for tomorrow. What is Dutch food.... hmmm, this I am very much looking forwrad to reading. Thanks! First day went well - day two is tomorrow. I'll write about it, but I figure I gotta give the kid some time. Dutch food doesn't really make it out of the Netherlands, but things related to sweets are especially delicious. Haha, I don't know how much help I'll be. I expect to report some burnings or misread measurements... But pannenkoeken from scratch is so easy you'll be amazed.